People say that to learn how to cook, you must find a grandmother. 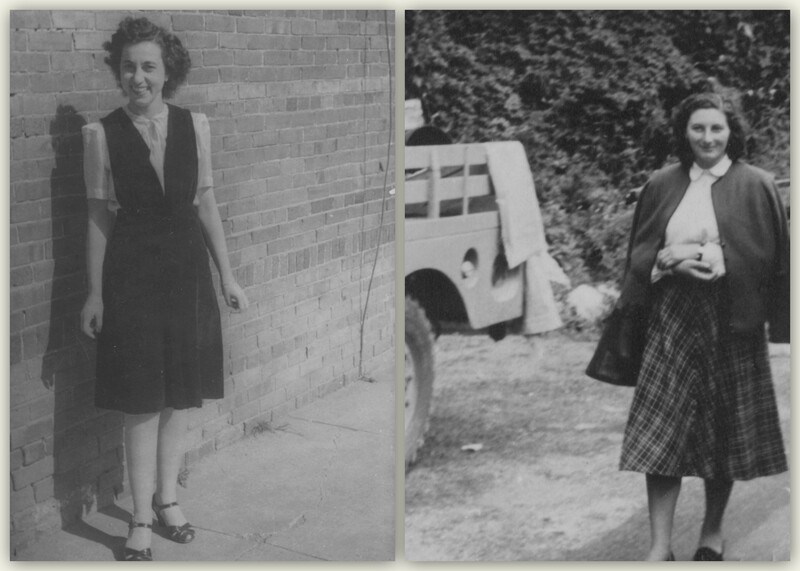 I never met either of my grandmothers, since they died before I was born. So when I came across an article from the 1970 Waterloo Courier tucked between the pages of a scrapbook, I thought I had struck gold. In this “Shop Talk” featurette, my grandmother, Mary, stands in her kitchen, sharing her trademark Italian recipes: ricotta and spinach ravioli, spaghetti sauce, zucchini casserole. Here was my culinary ancestor preserved in print, offered up to the world (or at least the townspeople of Waterloo, Iowa). 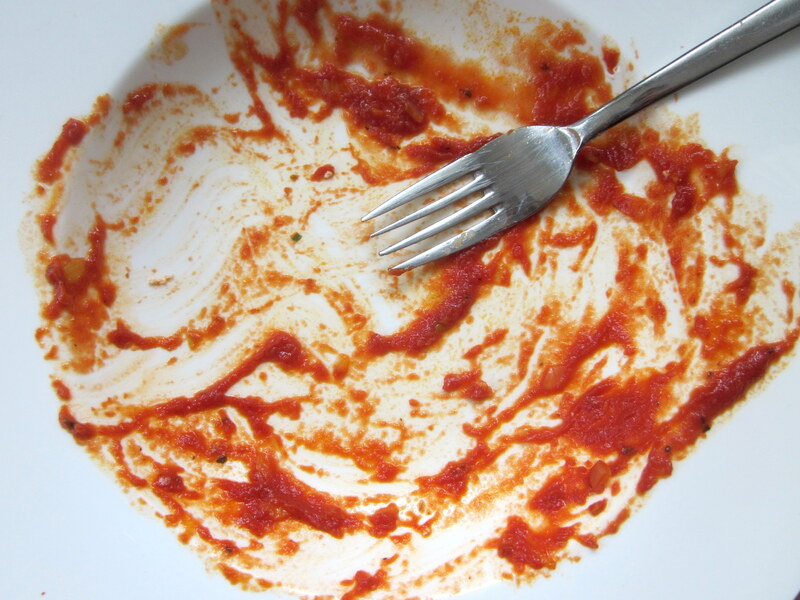 I began to see the ravioli already, piled high in her painted bowl that I took with me to college – ricotta-filled pillows for my dreams of maternal heritage. 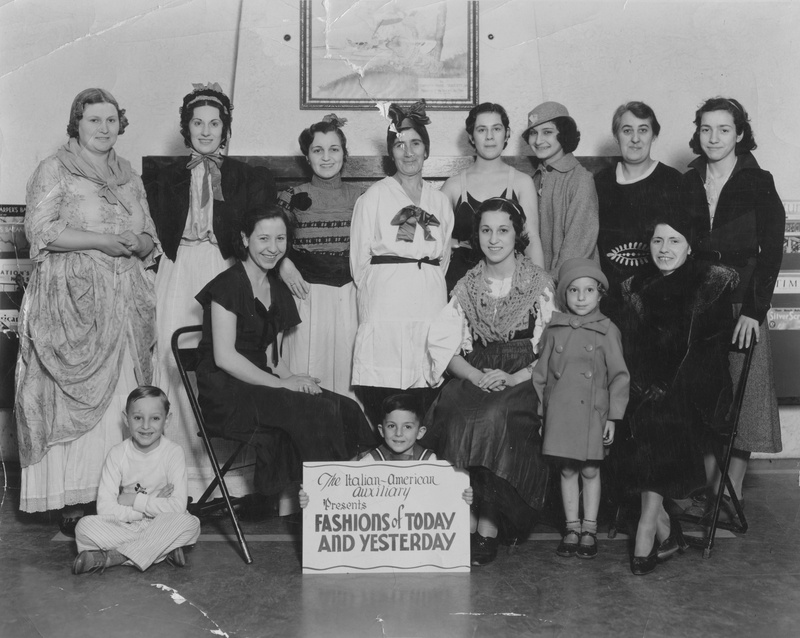 “The Italian-American Auxiliary Presents Fashions of Today and Yesterday.” Grandma Mary Amelang (née Stabile) is seated center-right, in peasant dress and shawl. I knew that my grandmother was part of that defining story of melting pot America from the early 1900s. Her Campania-born parents passed through the fabled gates of Ellis Island, where her maiden name became “Sta-BILL” instead of “STAH-bee-leh.” Then they moved from a tenement on Little Italy’s Mulberry Street to the greener pastures of the meatpacking Midwest. Love, or something like it, struck in the form of goofy Merle Amelang, who hailed from a ramrod-straight German family in Iowa. And from this, the world as I know it began to take shape: three boys and a girl, the motley crew of uncles, aunt, and Dad that has witnessed my own growth – just high-schoolers in this article. I asked the four siblings about Mary’s Courier-worthy ravioli but, as I made my way down the list, I realized that the flat responses weren’t just worsening senior moments; these ravioli were simply not a thing in the family. Spaghetti sauce was a common enough sight on the dinner table, and lasagna and mostaccioli made appearances on special occasions, yet no one remembers seeing their mom stuff dough with this filling. 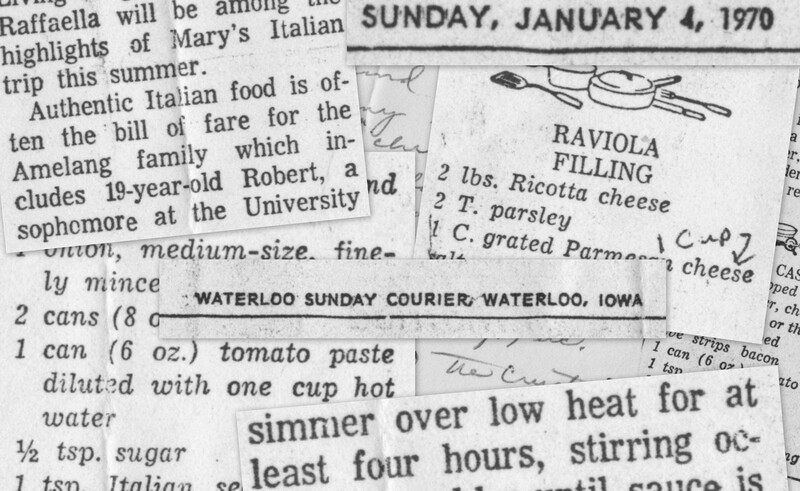 Instead, my aunt recalls Mary borrowing the ravioli rolling pin for the article photo shoot – and she’s pretty sure they didn’t even have ravioli for dinner that night. Beyond the “Mamma Mia!” beehive-and-pearls kitsch, there was a real mystery. Maybe my grandma was playing the writer, or the writer was playing the reader, but somewhere, something had been lost in translation. 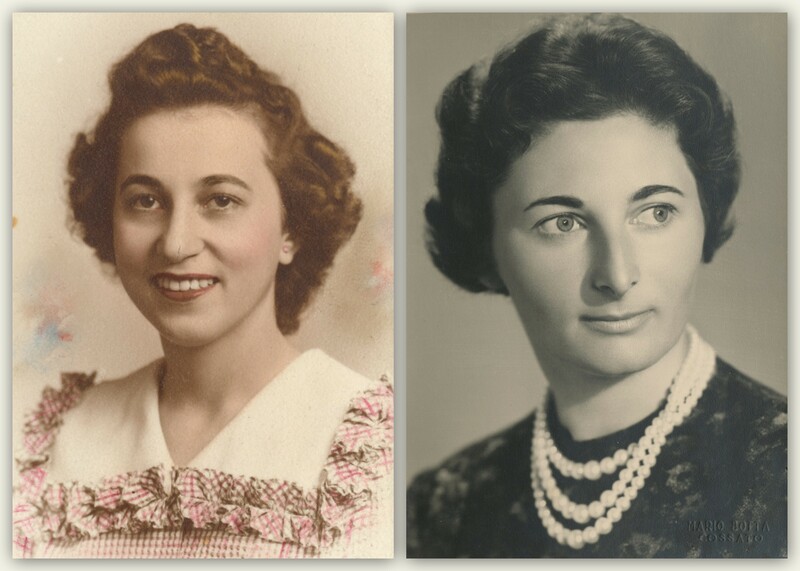 I began to think of my other grandmother, Liliana, on my mother’s side, who was born, raised, and died in a two-horse town called Cossato, nestled in the Italian Alps. This is a woman who spent a week cooking in preparation for a visit from a Roman telephone operator; she had invited him to the mountains for a hunting trip as a thank-you for putting her in touch with my mom, who was at college far away in the Midwest, long before the age of Skype. Lavish Piemontese spreads of antipasti were Liliana’s strong suit. I wondered how she might react to Waterloo’s idea of “typical dishes Italian cooks are expected to prepare.” Indigestion was a strong possibility. I looked at the recipes through Nonna Liliana’s eyes: what were meatballs doing over stuffed pasta? Is “raviola” even a word? Why would someone need a whole can of tomato paste? Who in God’s name would put sugar in tomato sauce? Were they trying to ruin it by cooking it for four hours? I realized that these nonnas would have probably butted heads if they had ended up in the same kitchen. I needed to break up this fight. 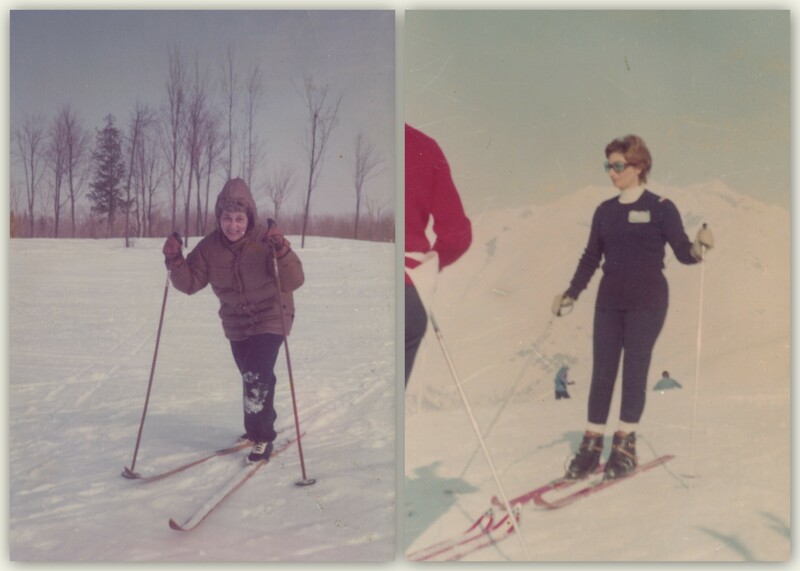 From the Plains to the Alps, the nonnas on skis. A young Mary Stabile and Liliana Lavino. 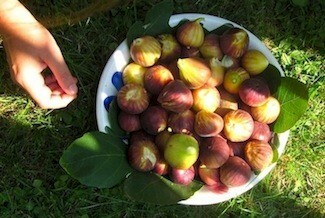 All the trouble lies in that single word: “authentic.” It will turn an Italian into a snob, an American into a sap. Italians starting over in the U.S. at the turn of the twentieth century created a whole new culture, one that was a natural offshoot of the traditions of the homeland and an adaptation to new conditions in turn-of-the-century America. Whole cans of tomato paste were stirred into a sauce to embolden the watery taste of standard-grade tomatoes (in Italy, instead, paste is sold in tubes like toothpaste, meant to be used in small amounts). Sugar found its way into the pot in an attempt to resurrect the sweetness of formerly local San Marzano tomatoes. Vast quantities of meat from the American heartland took center stage in new renditions of pastas and mains. Sauces were simmered for hours with handfuls of garlic cloves to coax as much flavor possible out of less-fresh ingredients. This was Italian-American cooking, not Italian – equally valid, just different. And Italians will get testy with slip-ups in this vocabulary. 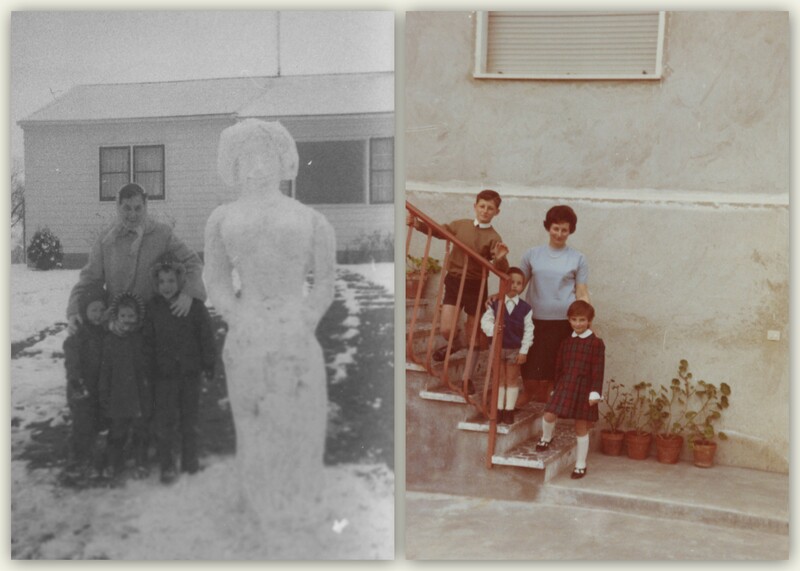 Left: Mary & the first three of the brood standing in front of their home in Waterloo, Iowa, with snow goddess sculpted by Merle (my dad is on the left). Right: Liliana & her three children posing in front of the family home in Cossato, Italy (mom is on the bottom step). The women and their men: Mary and Merle to the left, Liliana and Giuseppe to the right. But even when you’re careful with your definitions, authenticity is tricky. Are Grandma Mary’s “raviola” authentically Stabile family fare? Where is the line between authentic Italian and authentic Italian-American? These truths are hard to pin down, maybe even impossible. Sometimes recipes fail us. And sometimes we forget that, behind the glossy page, there is much measuring, glazing, carving, browning, and skimming at work. Life is never as neat and effortless as a recipe on a food blog might have us believe – just like the rest of social media. My hunch is that the Courier writer learned of Mary’s family background and upcoming trip to Italy through the Waterloo grapevine, and then pitched an idea for a feature, envisioning something along the lines of The Godfather kitchen scenes. She probably wanted to spice up the usual spaghetti-and-meatballs routine that had already began to charm its way into the heart of Americans – hence the ravioli. And Grandma Mary would have called around, asking friends and family for a recipe. Tack on some mentions of the Old Country, and you’ve got yourself an exotic write-up. No one specific’s fault, just a reflection of the times. It’s an editorial mistake that has been made countless times as we explain immigrant kitchens from all over the globe. Curious spirits: Mary and Liliana on their travels. But there is sincerity in the article, perhaps just not in its measurements. Grandma Mary wanted to affirm her connection to the country of her forbearers, with the same curiosity that has me turning the pages of old scrapbooks. As the Courier reports, it led her to host an exchange student from Turin named Raffaella. Less than an hour’s drive from Turin sits Cossato, where Nonna Liliana encouraged my mom to take off for the States. Mom ran into Dad, and with my arrival the Italian and the Italian-American became even more muddled. 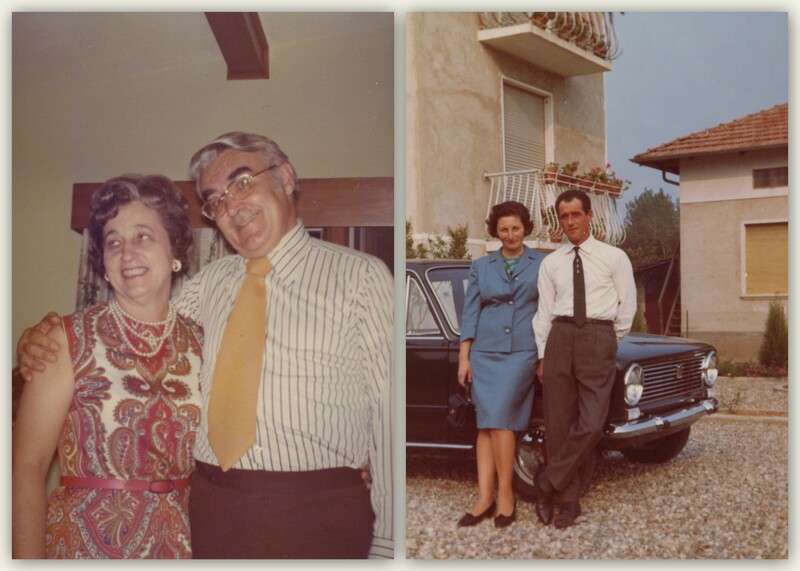 Years later, I retraced my mom’s steps and moved to Turin, where I met up with Raffaella. She led me through the porticoed walkways of the city and gave me my first taste of burrata cheese. As she told me what a great time she had in Waterloo, Iowa, the sap and the snob battled it out inside me. I knew more about my grandmothers than I had thought. And so the strange dance between homelands continues, always with plenty to eat. So that’s where you get your cooking prowess from. Bravissima Cosima! E’ stato un piacere leggerlo. Nelle foto noto somiglianze tra Richard e Antonella ed i tuoi nonni. . Bello il paragone tra i parenti delle pianure e quelli delle montagne. Grazie Riccardo! Sospettavo che ti sarebbero piaciute le foto delle nonne sugli sci! Thank you for this comment, Jay. I love the secrets behind kitchen favorites – how sometimes they’re illusions, sometimes they’re almost miracles, but it really doesn’t matter because it’s about how it makes you feel – the emotional nourishment. It’s an experience that all of us Italian-Americans share! Agreed! The family resemblance is uncanny.